One of the greatest gifts in the Jewish community in the 21st century has undoubtedly been the addition of the PJ Library. Started by Harold Grinspoon's philanthropic foundation, the PJ Library now sends over 100,000 free books to Jewish families each month through the generosity of local Jewish philanthropists. As I wrote about last June on this blog, the PJ Library's 3 millionth book was given to the daughter of a good friend of mine in Livingston, New Jersey. My three children have amassed an entire bookshelf worth of complimentary PJ Library books over the years. These books have covered all of the Jewish holidays, Shabbat, Israel, Jewish history and Jewish ethics. My family is grateful for the wonderful gift of literature that has made the PJ Library such a meaningful endeavor. But as great as the PJ Library is, the books are really more suitable for children up to a certain age. After a child reaches age 9 or 10 there are few offerings for the pre-teen crowd (although the PJ Library is beginning to add these more advanced books to its monthly offerings). As my oldest child approaches double-digits in age, I've begun to collect more advanced books with Jewish themes. 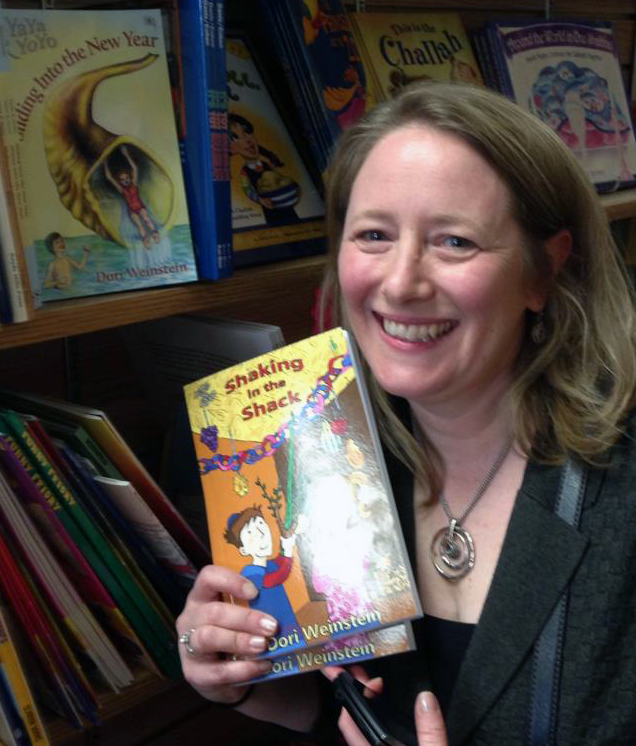 One such book that my son has already enjoyed is Dori Weinstein's "Shaking in the Shack." This book is the second in the author's YoYo and YaYa series and is published by the author's own Five Flames Press in St. Louis Park, Minnesota. Dori, a Jewish educator, began writing these books -- she's currently at work on number three in the series -- because she too was looking for modern Jewish books for her own children as well as for the students she was teaching. While there is no shortage of these Jewish themed books for younger children, especially the pre-school cohort, the options become very sparse for middle school age children who were used to more challenging books like the Harry Potter series. Dori's first stab at a pre-teen novel based on a Jewish holiday came out in 2011 when "Sliding into the New Year" was published by Yotzeret Publishing. That book was named a 2012 Moonbeam Children’s Book Awards gold medal winner in the category of Young Adult Fiction-Religion/Spirituality. Dori's goal is to write 12 books in which we watch boy-girl twins Joel Silver (YoYo) and Ellie Silver (YaYa) grow up during a year of their lives. As my own twins -- also a son and a daughter -- get older I'm sure they'll appreciate and be able to relate to YoYo and YaYa (both nicknamed after their Hebrew names Yoel and Yael respectively). 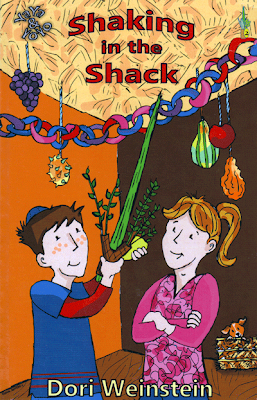 Dori's recent book is perfect for the Jewish holiday of Sukkot that begins tomorrow night. "Shaking in the Shack" takes place during the Sukkot festival and focuses on the Jewish value of helping those less fortunate. YoYo loves to be a comedian and to play practical jokes, but when he, YaYa and the rest of their fifth-grade Hebrew school class find a mysterious four-legged visitor in the synagogue's sukkah they all take it seriously. Their unexpected adventure brings the twin brother and sister duo face-to-face with the importance of shelter and caring for those in need during Sukkot and year round. The book hits on the core themes of Sukkot like hachnasat orchim, being hospitable and inviting guests into the sukkah. It also has a subtle way of teaching all of the ingredients of the fall holiday including about the lulav (palm branch) and etrog (citron), as well as the ritual of ushpizin, the mythical guests of the sukkah. Dori has decided to switch between the two protagonists as narrators in each successive book so that "Shaking in the Shack" is narrated by Joel (YoYo). In the book, he really comes across as the typical 5th grade boy who shows both a silly side as well as a maturing serious side with all of the awkwardness most pre-pubescent boys exhibit. When I recently met Dori during her summer swing through Detroit on a family-vacation-slash-book-tour, she couldn't contain her excitement over the new book. Every time another Judaica store or synagogue gift shop agreed to sell her KidLit series, she enthused on Facebook how YoYo and YaYa will now be available in another Jewish community. The YoYo and YaYa series is ideal for 8-12 year-olds, but even the bar and bat mitzvah age teens will enjoy them. Happy Sukkot and Happy Reading Kids! This is a great series of books that fills a void for this demographic of children! Highly recommended.